A couple of weekends ago, I had the pleasure of making the virtual acquaintance of a new follower who's closet I truly admire, Rosalynn, who shared with me her three most favorite babies. And even though Susan Boyle wasn’t singing, I got the same kind of chills when I saw them. First is the famous Yves Saint Laurent Tribute Mary Jane that has been seen on all the glamorous celebrities having their red carpet moments. Priced in the $800 - $900, it’s definitely a splurge but an investment nonetheless. Second is the Brian Atwood Maniac. I have yet to personally sample Brian Atwoods, so my curiosity is quite large. Ms. Rosalynn says they’re quite comfortable. Brian Atwood is slightly more affordable in the $500 range but still not quite ATM status. 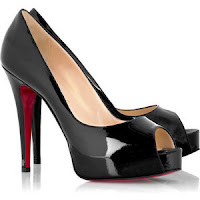 And last, but not least, is the Christian Louboutin Hyper Prive Peep Toe. 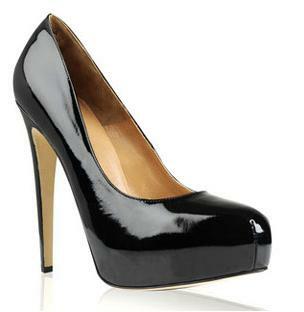 Priced at $865 at Saks Fifth Avenue, they truly are a shoe closet staple and long term investment piece. Ms. Rosalynn has had them for about two years and recently got them resoled. Now, when a woman goes to the trouble of resoling her shoes, you know they MUST be comfortable. A big thanks to Ms. Rosalynn for being so sweet and letting me into her Working Girl's Shoe Closet. ;) You can follow Ms. Rosalynn at: http://twitter.com/rozfashionista. A lot of people think I'm silly for spending so much on shoes, but to me they're an investment, and once you buy a pair of shoes like these, like you say, they'll last a lifetime. If I can only recommend one pair of designer heels, it'd be one of these as they go with literally anything - from the dressiest dress, to the smartest pencil skirt, even down to the most casual of jeans. Like you say, what you spend doesn't translate into how comfy these shoes are - for comfort, though, the YSLs are hard to beat, they really are. So yeah, thank you again for this great post, and I hope it helps people understand why sometimes paying a lot of money for shoes is so worth it. *CLAP* Bravo! Amazin post! I love it! Roz is an amazing stylist, she knows exactly what looks good, and she's undoubtadley very smart about her selections! Thanks to both of you for giving us such great information and for being honest about shoes and fashion!! Much love and continued success to both of you!! I must say Roz is truly a fashionista and amazing. I have gotten inspiration from her wardrobe stylings and myself have shop like she said towards investments and not on the spur. My wardrrobe has turned around and many have noticed and complimented me on this. BRAVO. Thanks Ladies! I am really glad the benefits of fashion, like investing in your shoe closet, resonates so well with you! :) xoxo!